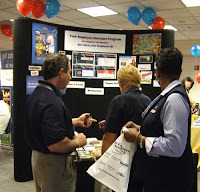 The Employee Network: Vegas Road Show Pics Up! Vegas Road Show Pics Up! Vegas Road Show Pictures Posted! Tons of pictures of our favorite members from Nevada. Check to see if you or your friends made it to our scrap book. We took these pictures at both offices of Southwest Gas, The Hard Rock and US Airways. Thanks to all that actually smiled and even posed for shots. We had a lot of fun taking these shots so have a look. and City of Henderson on October 22. We're looking forward to meeting all of you at North Las Vegas for the 1st time and thrilled to see you all again from City of Henderson. Come see us and pickup your VIP Cards and enter to win all the great door prizes. We'll have several new Merchants as well as some of your favorites as well.